Freddy vs. Jason is a 2003 American slasher action comedy film directed by Ronny Yu. The film is a crossover between the Friday the 13th and A Nightmare on Elm Street franchises. It is the eleventh and eighth entries in their respective series, pitting Freddy Krueger and Jason Voorhees against each other. The film is also the last film in both the Friday the 13th and Nightmare on Elm Street franchises before they were both rebooted. It was filmed in the United States, Canada and Italy. In the film, Freddy (Robert Englund) has grown incapable of haunting people's dreams as the citizens of Springwood, Ohio, have mostly forgotten about Freddy with the passage of time, as well as the fact that the current generation of teenagers are kept ignorant of his existence. 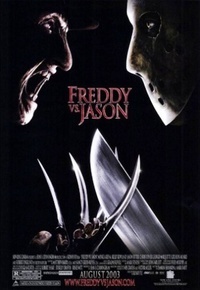 In order to regain his power, Freddy manipulates Jason (Ken Kirzinger), into resurrecting himself and traveling to Springwood to cause panic and fear, leading to rumors that Freddy has returned. However, while Jason succeeds in causing enough fear for Freddy to haunt the town again, Jason angers Freddy by depriving Krueger of his potential victims. This ultimately sends the two undying monsters into a violent conflict. This webpage uses material from the Wikipedia article "Freddy_vs._Jason" and is licensed under the GNU Free Documentation License. Reality TV World is not responsible for any errors or omissions the Wikipedia article may contain.